Being interviewed for a position can be an intimidating experience, but the increasing trend for video recruitment means there’s a whole new set of factors to take into account. If you’re not used to being on camera, giving a video interview may be nerve-wracking, but it has a number of benefits for both you and your potential employer. Easier to arrange and more convenient for all parties to attend, particularly if they live some distance apart, video interviews are growing in popularity. Although many of the golden rules remain unchanged, there’s a new set of challenges and potential problems which need to be considered. Here are just 5 of the things that you should always consider when you’re being interviewed by video. Regardless of whether the role you are being interviewed for involves public speaking, your voice is a powerful tool in persuading the individual to hire you. Clear, concise diction, with an agreeable tone will be a pleasure to listen to and can help the interviewer to pay close attention to what you are saying. Unfortunately the microphone on your computer may make you sound tinny, quiet and add a strange timbre to your tone. This is less than ideal and could influence your interviewer’s desire to listen to your answers. The other problem with computer microphones is that they pick up every other noise in the room, adding a soundtrack that you would rather not include. Whether it’s other people moving around, pets, noise pollution or other sounds, it can be a real distraction during the interview. The best way to get round this is to eschew the computer microphone and instead use a headset. This will eliminate all other noises and ensure that your answers are conveyed clearly and that your voice has the opportunity to influence the interviewer as you hoped. The other benefit to using headsets is that you will instantly appear more composed, professional and organised, rather than giving the impression that everything was put together in a rush. When you’re applying for jobs, you might think nothing about handing about your email address and user name, happy to rely on more modern means to secure a position. But if your accounts were set up originally for non-professional purposes, don’t forget to consider the type of reaction that your name could provoke. Ideally you’ll want a user name or address which is your regular name, but this might not always be possible. However, having something which is rude, offensive or just unprofessional will create an instant opinion which isn’t favourable. If your existing account isn’t suitable for use with a prospective employer, consider either changing the name or setting up a brand new one for the purposes of recruitment. A lot depends on the job that you’re applying for but there may be the opportunity for you and the interviewer to screen share, so that you can demonstrate some practical skills. This can be the perfect opportunity to showcase what you really know but make sure you’re aware of everything that they can see. This means that if you’ve been googling to check facts that you claimed to already know, you could blow your chances of getting a job. Having other chat windows open is also an extremely bad idea, even if you haven’t been using them during the interview. There’s always the chance that a friend or acquaintance could pop up and make a derogatory comment or remark during the interview. There’s nothing worse than mistiming your comments and either sat listening to a stony silence or constantly talking over the person who is trying to interview you. 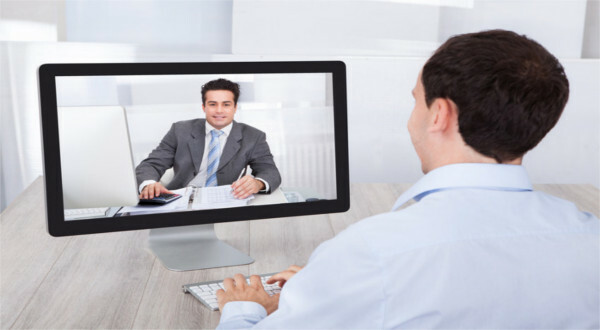 It’s especially important to demonstrate an ease with technology if the role could potentially involve the use of computers or modern methods of communication, such as video conferencing or Skype. There’s a real art to conversing over video, and it’s not as easy as having a physical face to face discussion. You’ll need to take account of the lags or delays that the transmission might cause and ensure that you match the rhythm of your conversation to this. Unlike a physical interview, you’ll have to put much more work into creating the right position when you’re being videoed. Rather than simply pulling up a chair at an interview table, over video it’s up to you to create the right position which is neither too close nor too far. Don’t forget to check the results before you go live, so you can see the view that the other party will see. You shouldn’t be higher than them, looking down can make you appear arrogant and superior. By direct contrast, position your chair too low and you’ll give the impression of being meek, mild and subservient. Once you’re sure that you’ve got the position right, do a final check for any blurs, smudges or marks on the lens. This can be very distracting for the interviewer and may mean that you come across as less than professional as a result. Nick Williams works for Acuity Training in the UK and helps on their communication and assertiveness training courses.